Learn how to evacuate safely when a fire alarm goes off. 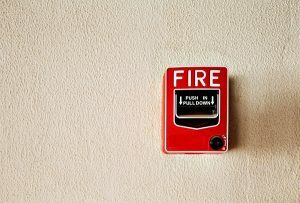 Every home and business is equipped with a fire alarm (or it should be). Fire alarms work to alert occupants of evacuating the building. In fact, there are smart and safe ways to keep yourself, your family, clients, and employees safe in a fire emergency. Probably the most important tip, making sure you actually evacuate a building when you hear a fire alarm is essential for your safety. In fact, you really want to evacuate a building as soon as possible if you hear a fire alarm going off. This should ultimately be a rule that everyone in the building knows about. It’s paramount that evacuation process is safe and orderly. In fact, a laid-out evacuation plan that details precisely where people need to go is integral to evacuating a building safely. That is why having an evacuation plan gives everyone the opportunity to exit without suffering any potential injuries. As a result, keeping the evacuation plan in an area that is often frequented could provide some calm in the event of a fire. Knowing how to get out is one thing, being able to is an entirely different issue. In fact, once you create the evacuation plan, you’ll want to make sure that all escape routes should be free and clear. Don’t let items pile up near the escape routes. This ensures that everyone will be able to evacuate safely in the event of a fire emergency. Once everyone has made it out of the building, you’ll want to keep away from the building itself. In fact, standing a few hundred feet away is ideal when there is a fire event. As such, consider heading across the street or down the sidewalk if you find yourself evacuating a building that has caught fire. KEEP YOUR HOME OR BUSINESS SAFE WITH ANDERSON FIRE PROTECTION, INC. This entry was posted on Friday, June 1st, 2018 at 4:21 pm. Both comments and pings are currently closed.